Across the road from Kilmainham Gaol, the grounds of the Royal Hospital Kilmainham is a great spot to go for a stroll. Along with a big open green and gardens, the Irish Museum of Modern Art is also located here and is the home of the national collection of modern and contemporary art. You can enter at the gate in Kilmainham (near the Gaol) or on Military road. The area is served well by Dublin Bus and the Red Luas line. 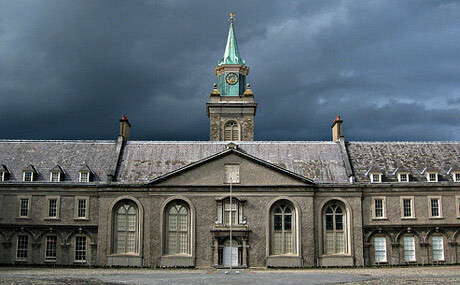 The Irish Museum of Modern Art is housed in the Royal Hospital Kilmainham, the finest 17th-century building in Ireland. The Royal Hospital was founded in 1684 by James Butler, Duke of Ormonde and Viceroy to Charles II, as a home for retired soldiers and continued in that use for almost 250 years. The style is based on Les Invalides in Paris with a formal facade and a large elegant courtyard. The Royal Hospital in Chelsea was completed two years later and also contains many similarities in style. The Royal Hospital Kilmainham was restored by the Government in 1984 and opened as the Irish Museum of Modern Art in May 1991. Address: Royal Hospital, Military Road, Kilmainham, Dublin 8.